ANKARA, Turkey — Turkish tanks and artillery have attacked Islamic State group positions in Iraq and in Syria in retaliation for the suicide bombing in Istanbul which killed 10 tourists, Turkish Prime Minister Ahmet Davutoglu said Thursday. Close to 200 extremists were "rendered ineffective" — the government's term for "killed" — in the offensive in the past 48 hours, Davutoglu said. It was unclear how Turkey verified the number of dead or their membership in the extremist group. He spoke a day after Kurdish rebels detonated a car bomb at a police station in southeastern Turkey, then attacked it with rocket launchers and firearms. Six people were killed including civilians, officials said. It was a further sign of the deteriorating security situation as the country grapples with both the Islamic extremists and the rebels who have intensified attacks in the country. Davutoglu, speaking in Ankara, said the military targeted some 500 extremist positions along the border with Syria and near a Turkish camp in northern Iraq. He did not rule out possible air strikes against the group, although a day earlier, he said Russia was obstructing Turkey's ability to conduct airstrikes against the IS in Syria. The Turkish leader said Ankara decided to hit the IS group as soon as it had determined that it was responsible for the "heinous" bombing at Istanbul's main tourist district, just steps away from the landmark Blue Mosque. All the victims were German tourists. "Turkey will continue to punish with even greater force any threat that is directed against Turkey or its guests," Davutoglu said. "We will press ahead with our determined struggle until the Daesh (IS) terrorist organization leaves Turkey's borders ... and until it loses its ability to continue with its acts that soil our sacred religion, Islam." The Kurdish rebel attack late Wednesday targeted the police station in the town of Cinar, in the mostly Kurdish Diyarbakir province, and police lodgings located at the building, the Diyarbakir governor's office said. The force of the blast caused a house near the police station to collapse. 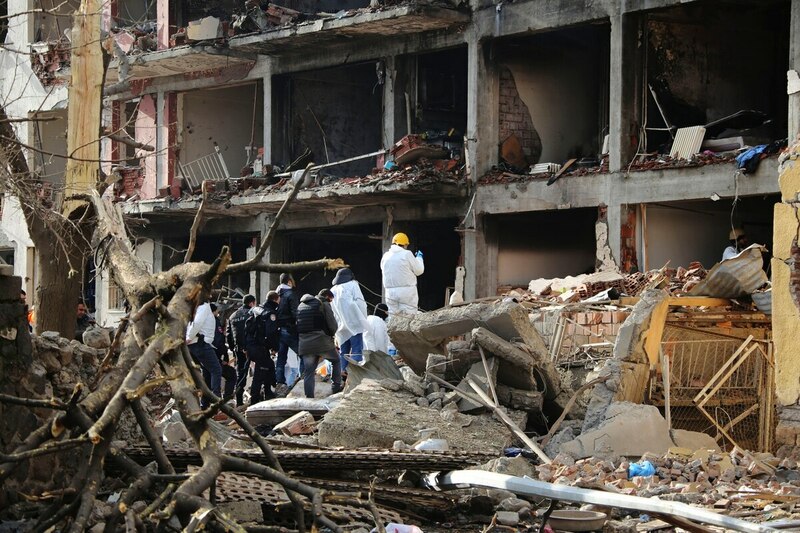 The private Dogan news agency said the dead included the wife of a policeman and a 5-months-old baby who were killed at the police lodgings and two children who died in the collapsed house. Another police station was attacked with rocket launchers in Midyat town, in the province of Mardin in what appeared to be a simultaneous assault, the state-run Anadolu Agency reported. No casualties were reported there. The explosion caused extensive damage, affecting buildings two or three blocks away from the police station. Windows were blown off and shop shutters were folded in from the force of the blast. The governor's office said the security forces responded to the attack, but it was not clear if there were any casualties among the rebels. "We were sleeping and woke up thinking it was an earthquake," Shafee Dagli, a Cinar resident told The Associated Press. "Then the clashes started. They lasted for about 2 1/2 hours, from 11.30 p.m. to 2 a.m."
Hediye 0zaltay, mother of five living behind the police station said: "We were so frightened. We were awake watching TV. All these fragments blew into our yard from the blast. At first we thought there was an earthquake then I looked at the police station and saw fire." The attack came a day after the suicide bomber set off the explosion in Istanbul. Turkish officials say the bomber, a Syrian born in 1988, was affiliated with the Islamic State group. Interior Minister Efkan Ala said seven people have been detained in connection to the bombing. Hundreds of people gathered at the site of that attack on Thursday, to lay flowers and hold a minute of silence. The conflict between the government forces and the PKK has killed tens of thousands of people since 1984. The group is considered a terror organization by Turkey and its western allies. On Thursday, mourners at Cinar buried three of the dead — Lokman Acikgoz, who owned a local shop, and his two sons. Dominique Soguel reported from Cinar, Turkey.